SCVMM is a complex product, but it provides the capabilities to manage entire virtualization stack of an organization. SCVMM can manage Hyper-V, ESXi, and Citrix XenServers. SCVMM provides host groups as a basic management unit for resources such as network and storage. You can also configure placement rules, dynamic optimization settings on the property page of a VMM host group. When you add virtualization hosts under VMM management, VMM agent collects all the settings that are configured on the virtualization hosts and helps you configure or maintain the settings from the central VMM management console. In other words, VMM allows you to configure virtualization hosts via VMM by means of the configuration tabs that are available on the property page of a virtualization host. By just looking at the configuration tabs, a virtual administrator can always get an idea as to what these configuration tabs are all about. However, by just looking at the configuration tabs is not going to help you unless you know how this information is useful to you before performing an action or configuring a feature. There are several configuration tabs available such as General, Status, Hardware, Host Access, Virtual Machine Paths, Reserves, Storage, Virtual Switches, Migration Settings, Placement Paths, Servicing Windows, and Custom Properties as shown in the screenshot below. In this article, we are going to take a close look at General, Status, and Hardware tabs. Domain: It shows the domain name to which this Hyper-V host is joined to. SMBIOS ID: This is the unique ID that is discovered from the Hyper-V host and used by VMM when performing a bare-metal deployment. Description: In case you need to type a short description for identification purpose, you can do so by typing some text in the Description text box as shown in the screenshot above. Storage: Shows the total capacity and available storage on the Hyper-V host. Virtualization Software: Shows the virtualization software running on the destination virtualization host. VMM Agent: It is important to note that VMM does not notify you if a Hyper-V host is running an outdated version of the VMM agent. However, since General Tab shows the VMM Agent version that is running on the Hyper-V host, by just looking at the General Tab, you'll know if the current Hyper-V host requires an updated version of the VMM Agent. You can also design a PowerShell script that can help you get VMM Agent versions on all managed Hyper-V hosts. 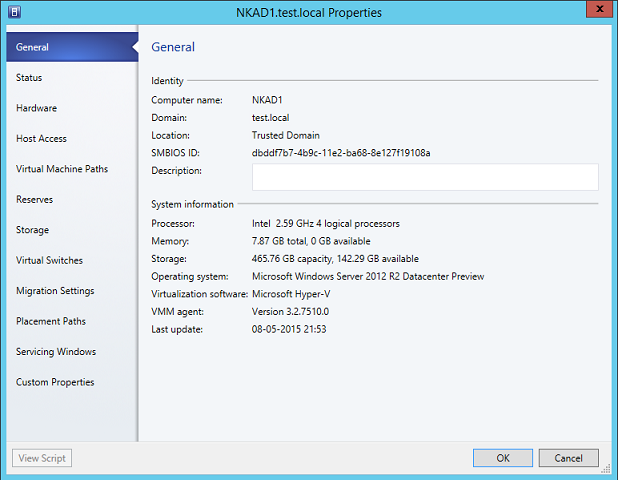 Last Update: Shows the last date when the VMM agent was updated on the Hyper-V host. In case a VMM or Hyper-V related component is not working on the destination Hyper-V host, you are going to take a look at the Status Tab. Status Tab, that is the next tab, shows the overall status of Hyper-V and VMM related components running on the destination Hyper-V host as shown in the screenshot below. As you can see in the above screenshot, the Status Tab shows the overall status of all the components. It also shows the status of each sub-item such as WinRM component on Hyper-V host, VMM agent service status, VMM agent version and WMI performance counter. Note that there are two buttons available on the Status Tab; “Repair All” and “Refresh”. If Hyper-V host is experiencing any issues or not able to communicate to the VMM Management Server, you can always use the “Repair All” button that might be able to rectify known issues on the destination Hyper-V host. Clicking on “Refresh” button will help you get current status for each item. If overall status shows “Critical”, it is always a good practice to repair the items by clicking the “Repair All” button. In case “Repair All” button does not solve the issues, consider rejoining Hyper-V host to VMM. There are two commands that you need to run one by one in the PowerShell command window. First command gathers the credentials for Run As Account and second command executes the repair function on Hyper-V host specified after “-ComputerName” parameter using the credentials that you specified in the first command. Hardware Tab shows the hardware related information for the destination Hyper-V host such as CPU, memory configured on the Hyper-V host, local storage, network adapters configured, etc. As you can see in the screenshot above, when clicking on the CPU, it shows the CPU related information for the destination Hyper-V host. This Hyper-V host has four logical CPU processors, CPU speed is 2.59 GHz and manufacturer is Intel. CPU Supports SLAT: The information that is provided on the hardware tab is useful in some cases. 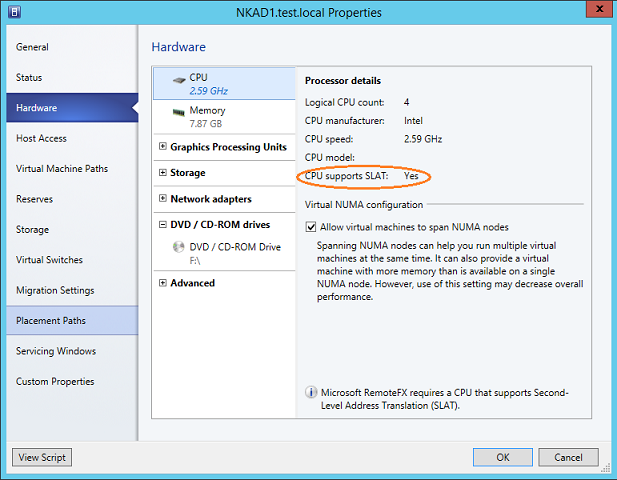 For example, before using SR-IOV feature of Hyper-V, the destination Hyper-V hardware must support Second Level Address Translation (SLAT). This is one of the requirements that must be met before using SR-IOV feature. This information is very much available on the hardware tab as shown in the red circle of the above screenshot. Therefore, before configuring the virtual machine to use SR-IOV feature, take a look at the “CPU supports SLAT” row. Enabling/Disabling NUMA: On the hardware tab, you also have an option to enable/disable NUMA for virtual machines. It is important to note that by default, Windows Server 2012 Hyper-V and later hosts enable NUMA spanning which, in turn, allows virtual machines to access and use memory across NUMA nodes. Whether to enable or disable NUMA spanning on a destination Hyper-V host must be considered by assessing the impact on virtual machines. Note that enabling NUMA spanning on a destination Hyper-V host will result in poor performance or virtual machine may not start if the required memory is not available in a NUMA node. 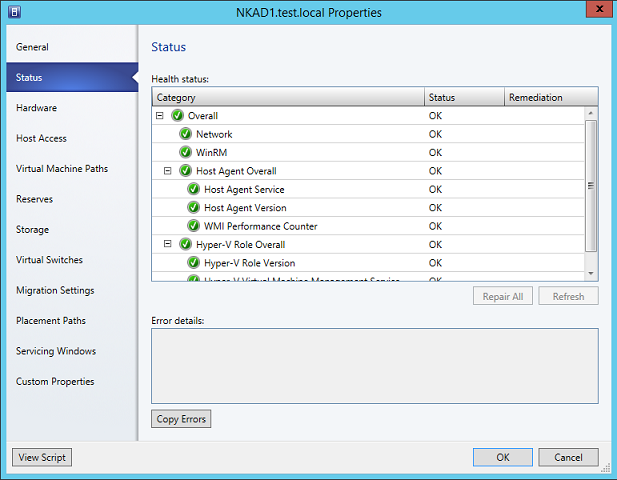 As a best practice, it is recommended that you disable the NUMA spanning on destination Hyper-V hosts and enable it only if you think virtual machines will not suffer from any performance issues. In this article, we looked at the General, Status and Hardware configuration tabs that are available on the property page of a Hyper-V host in VMM and the information that can be useful before you configure any feature. For example, hardware tab provides you necessary information before enabling SR-IOV for virtual machines. At the same tab, you can also enable/disable NUMA for Hyper-V host and use of “Repair All” button located on the Status tab helps you repair any VMM related components on the destination Hyper-V hosts. In the second part, we will continue to look at other configuration items available on the Hardware tab.